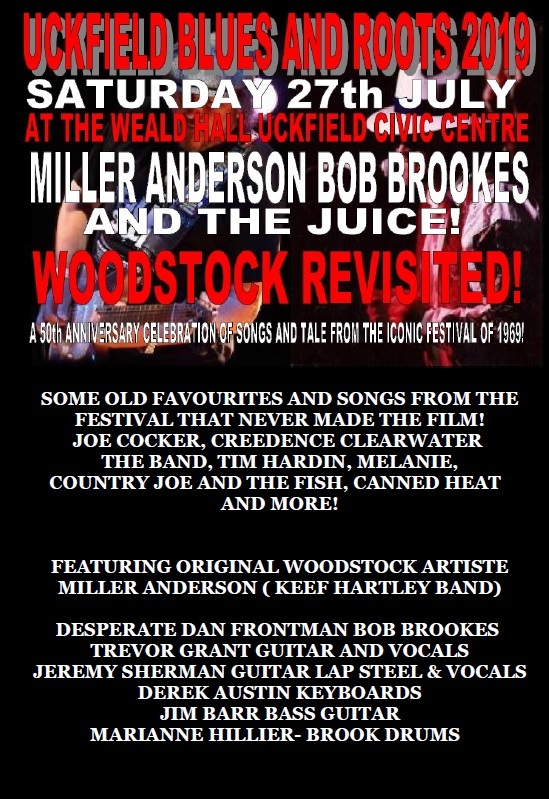 MILLER ANDERSON BOB BROOKES AND THE JUICE PLAY UCKFIELD BLUES AND ROOTS WITH A SALUTE TO WOODSTOCK THE ICONIC FESTIVAL OF 1969 ON ITS 50TH ANNIVERSARY! Songs and tales from the festival featuring original Woodstock artiste Miller Anderson who appeared at the festival with The Keef Hartley Band. Listen to some old favourites and some of the songs by prominent bands of the day that never made Woodstock the film! The songs of Joe Cocker, Credence Clearwater Revival, The Band, Melanie, Tim Hardin, Country Joe and The Fish, Canned Heat and more!